Grand Pré milk is a high quality milk made of 100% cow milk. What sets Grand Pré milk apart from the other milks? Simply the combination of the UHT (ultra high temperature) pasteurization process and the Tetra Pak aseptic container which blocks any light and heat infiltration that could alter the quality and the taste of the milk. This explains why Grand Pré milk can be kept for up to 9 months without refrigeration and for 20 days in the refrigerator after opening. 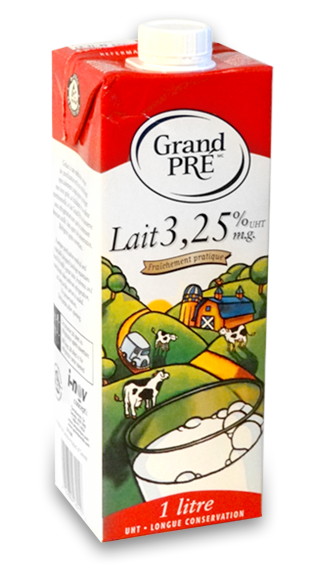 Grand Pré milk is available in the following varieties: 1% m.g., 2% m.g. and 3.25% and in different formats: : 1liter, 3x200ml, 3x1liter & 6x1liter (3.25% m.g. only available in 1 liter format). Whether you put it in your children’s lunch box or use it to cook your favorite meals, you will soon realize that Grand Pré milk is indispensable! Grand Pré milk is truly….conveniently fresh any time!